...in ensuring the continued high quality of school programs and activities for students at Bache-Martin? Of course you do! 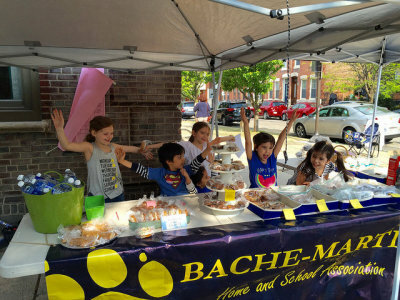 The Bache-Martin HSA has a number of volunteer opportunities available for you help us with keeping Bache-Martin as one of the premir elementary schools in Philadelphia. Not available during the week? No problem, we have weekend opportunities. Not available during the day? No problem, we have evening opportunities. Sporadically available? That's just fine, we know we have something that will work for you. To sign-up for any of the opportunites below or if you have any questions, please send an email to Aimee . Don't delay, sign up today! *Please note that the district now requires ALL volunteers in the schools, including field trip chaperones, to obtain a Criminal History background check, Pennsylvania Child Abuse History Clearance. * For more information, go to our clearances tab. Every day, during school hours. We are looking for volunteers to take shifts in at least 1 hour increments to sit at the front desk, make sure people sign in, and direct them to the main office. The most important shift to cover first is 11am-1pm, though other times of the day will be needed as well. Info on obtaining the school clearances can be found on the Clearances page. These will need to be submitted to the school secretary, Ms. Sue, before volunteering can begin. Please contact Tara , and let your friends, and neighbors know about this opportunity! Have you ever experienced an amazing block party in front of your school? We need your help with this amazingly fun festival for our students. 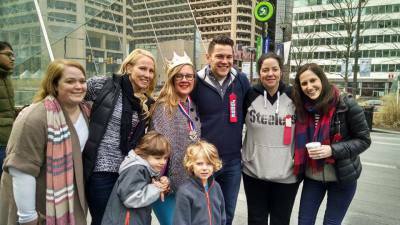 This year we were approved by the City to close off 22nd Street for the day, which allowed for more games and activities and for more classes to be out at once. It was a huge success with all! We need volunteers to help us with the various activities and games; from crafts, to handing snacks, to face painting. We have a task that can fit anyone's schedule. Can you be there next year to help us make it even more amazing? Contact Aimee ! When weather permits, we sometimes hold movie nights on the Brown Street Lawn on Friday evenings. We usually have one during the fall, in time for Halloween, and at least one during the spring/summer. The tasks are minimal: Setup, and cleanup, but we still need help. Because this event is held during off-school hours, and off-campus, it is perfect for those whose jobs aren't flexible during the day. Contact Aimee or Tara if you are interested in participating! Seeking bakers and folks to (wo)man the bake sale stands from when the polls open at 7am to when the polls close at 8pm on Election Day at the school. With now THREE polling locations at the school, we need your help to turn a day off from school into a fundraising opportunity. The funds go directly into the classroom, in the form of teacher requests. In the fall we have the Boo Grams, in the early winter we have the Holiday Shop, and in the early spring we have the Valentine Grams. Most of the preparative tasks for these fundrasiers are done outside of the school hours, but we do need some folks to help us distribute the joy to all of our students. Contact Jen if you are interested in making all of our Tigers smile! We need volunteers to serve a greeters starting at 8:30am at the school and be available to talk with attendees about their experience at Bache-Martin. Contact Jerilyn . Work together with other parents to plan Winter celebrations and events for all of our students. Two years ago there was the ice skating party for all families and Valentine's Day Dance for 7th and 8th graders. What could we do this year? Help us plan and figure it out. Help us with this family friendly open house, and fundraiser, benefiting Bache Martin! The goal of Bache in Bloom is to help support the Give and Go Athletics Recess program. In our innaugural year we had tours of the school, library, performances by our after school choir, and by our string students, a silent auction, raffles, face painting, games, and other childrens activities as well as food and beverages...and we can do even more with all your help. 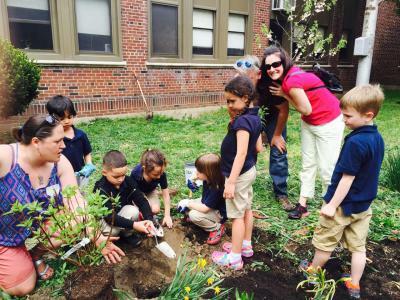 Work together with other parents and teachers to continue the development of our Science Garden/Outdoor Learning Lab, created with the assistance of the Coca-Cola Scholars Foundation, and currently being maintained with a generious grant from the Whole Foods Kids Foundation. The Science Garden/Outdoor Learning Lab is located in the southern courtyard of the Martin Building. 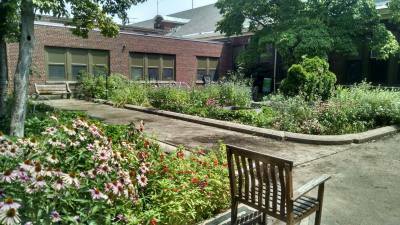 We also have other gardening locations (the front courtyard, and a few spaces in the Bache lot) around both schools plus Earth Day in April. No need for a green thumb to help! All we need is volunteers who love green spaces! Contact Nissa if you'd like to get involved. 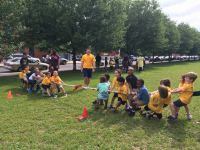 Field Day is a day for students K-8 to venture outside of the classroom for fun, and games. We need all the help we can get with planning, and executing, an fun filled day for all of our students! None of these opportunities tickle your fancy? We are always in need of volunteers to assist on various activities, such as distribution of fundraising orders, delivery of Valentine Day Candy-grams, coordination of donated school supplies, moving of donated furniture and goods, etc. Let us know when you are generally available and we will be more than happy to reach out to you! Email Aimee with your availability.